I know, I know. I really, truly know. “Put an egg on it!” has become the mantra of millennial home cooks everywhere (hey, we had to eventually move past putting a bird on it, okay?). Leftover pizza? Put an egg on it! (Actually do this, it’s really good). Have some plain, cooked oats kicking around? Honestly, put an egg on it. This thick, ultra-savoury cannellini bean, tomato, and cipollini onion concoction? Definitely put an egg on it. I first started making this recipe (courtesy of my much-used and very dog-eared copy of The Smitten Kitchen Cookbook) near the beginning of the summer. One evening, a few hours before hosting a dinner party that hadn’t gotten out of the planning stages yet (as my dinner parties are wont to do), I revisited this gorgeous little recipe. As expected, the recipe was simple to prepare and a huge hit with my guests (thanks, Deb!). Over the course of the summer I’ve done some tinkering with the recipe, nothing too over-the-top, but a few subtle changes have been made. I like to add a good glug of white vermouth or a super-dry white wine, I think it enhances the bright flavours of the tomatoes and adds complexity to the earthy cannellini beans and cipollini onions. I also like to add several sprigs of fresh thyme and oregano, I just leave them whole and remove the woody sprigs before serving. And speaking of serving, I like this dish best when it’s piled into a large, shallow serving bowl and accompanied by olive oil-brushed, thinly sliced crostini. The egg is used to revive any leftovers, although the way this lovely stew-like concoction disappears when placed in front of guests leaves me with no choice but to recommend a) sneakily hiding some away right in the back of your fridge off the bat or b) doubling the recipe. *If using fabulous, in-season tomatoes you may not need the sugar. Prepare the cipollini onions by boiling a large pot of water. Slice off the tips of the onions and plunge them into the boiling water. Boil for 1 minute and then drain, rinsing the onions with cool water so that you can handle them without burning yourself. When they’re cool enough to handle, slip the cipollini peppers out of their skins and set aside. On a large, rimmed backing sheet or roasting pan, spread the tomatoes (leave whole and pierce with a sharp knife if they’re quite small or halve if using large tomatoes). Add the cipollini onions, cannelini beans, and the head of garlic (leave intact while roasting). Generously coat the vegetables and beans with the olive oil, white vermouth or white wine, and sugar, using your hands to make sure the ingredients are thoroughly covered. Season generously with salt and pepper, topping with the fresh herbs. Roast everything for about an hour, using a spatula or wooden spoon to stir every 20 minutes or so. The ingredients should be blackened in spots and fork-tender, meltingly soft. The pan juices are what makes this dish, so be sure to save them. Remove the baking sheet or roasting pan from the oven and let the contents come to room temperature. Squeeze the roasted garlic out of its skin and mix in with the other ingredients. Stir in the cannellini beans and allow to sit until the mixture comes to room temperature, about 30 minutes. Serve the roasted vegetables and beans piled onto a serving bowl with thinly-sliced crostini. Reheat the next day and add a crispy or poached egg, the yolk should be soft enough that it thickens the leftover tomato sauce as they melt together. This song is tight as a wire, epic in scope, and vibrating with gigantic, bursting emotion. Interestingly, Perfume Genius is one of the few bands with vocals I can listen to when I’m writing (I usually find lyrics too distracting when I work). And of course, when I’m cooking (which is often part of work, anyway). If Perfume Genius is new to you (in which case I’m very jealous you can hear everything for the time), think PJ Harvey, Tori Amos, Wild Beasts, Kate Bush, and a tiny hint of Hawksley Workman without his annoying Canadian celebrity bravado. A can of chickpeas, an onion, and some garlic make up the most unassuming of all blank canvases for a meal. These three homely ingredients become something special when combined, add in other pantry staples and spices and a meal worthy of casual company can come together quickly and without fuss. For this Spiced Chickpea Stew I made excellent use of frozen butternut squash and spinach, although fresh would work just as well. I’m going for convenience when making a recipe like this one. This recipe will keep for several days in the fridge, I generally eat it as written for a day or two before I begin adding in little extras to stretch out the leftovers. Mashed sweet potatoes or carrots are lovely when mixed into this stew, rub chicken thighs with Ras El Hanout and olive oil and serve alongside the stew, or stir in a generous spoonful of this garlicky cashew cream with lime and cilantro. If there’s anything else I love more than a hearty stew it’s a crunchy, sweet, and tangy slaw to serve alongside (or on top!) of the chickpeas. The nigella seeds in the slaw aren’t strictly necessary, I’ve been using them a lot in salads lately and I find they complement the flavour of so many other ingredients I love, they look so pretty and they have such a lovely bright citrus flavour. The fun in this recipe is its flexibility, it’s a dream of a meal to put together when you have a the basic ingredients and a handful of miscellaneous items hanging about in the kitchen. Heat the olive oil in a large skillet over medium heat. Add the red onion, garlic, butternut squash cubes, red sweet pepper and cook until the vegetables start to soften. Add the Ras El Hanout (or spice blend of your preference), cumin, coriander, and a generous pinch of salt and cook with the vegetables for 2 minutes, stirring frequently. Add the entire can of chickpeas, including the liquid (this will help thicken the stew) and the vegetables stock. Simmer uncovered for 10 minutes or until some of the liquid has evaporated, stirring in the spinach to cook over the last few minutes. Serve the stew piping hot with a dollop of Greek yogurt or at room temperature with a side of Orange Cucumber Slaw with Nigella Seeds. Combine all the ingredients in a bowl, gently stirring to combine. Serve with Spiced Chickpea Stew with Butternut Squash and Spinach (or, stuffed into a pita with shredded chicken, butter lettuce, and mayonnaise mixed with a small amount of orange juice and zest). Flowing slowed down shimmery songs like this one have always been a weakness of mine, I blame it on an early obsession with Mazzy Star, Belly’s sophomore album King, and Suzanne Vega. This simple slow cooker recipe for vegetarian chili is reliable, comforting, and very adaptable. I realize it doesn’t follow any of the strict guidelines that a truly authentic chili would, but I think that’s what gives this recipe a sense of fun and spontaneity. I dreamed this version up while I was taking an early morning train from Seattle to Vancouver. The sun was just beginning to come up, bouncing across the steely water and turning the waves gentle shades of lilac and rose; Mt. Rainier was a constant blink of gold in the distance. The tracks would briefly touch on forested areas that were coated with softest white, Puget Sound weaving in and out of view as we got closer to the Canadian border. The quiet of the early morning train was welcome as I read my new copy of Niki Segnit’s Flavor Thesaurus, a superbly witty and informative read that I warmly recommend to anyone curious about pairing and truly tasting food. If you’re anything like me you find it impossible to read about food without planning meals in your head and by the time we got home to Vancouver I was in a state of absolutely needing to cook something nourishing and wonderful. My plan was to make something in my slow cooker, so that I could take a nap and then get up to the smells of simmering vegetables. I decided on vegetarian chili, which for some reason I have always made instead of a regular chili with meat, so I felt comfortable riffing on tradition. If you want to try different vegetables I would recommend frozen corn, poblano peppers, diced carrots, celery, cremini mushrooms, roasted peppers, eggplant, or butternut squash. It’s very important to cook the onions and other aromatics together first in a skillet, the onion flavour loses some of its intensity and the spices gain focus before they’re added to the slow cooker. I’m particularly fond of topping my chili with a crispy fried egg and avocado, both lend a soothing creamy component that is only further enhanced by a quick application of Sriracha. Potential toppings: crispy fried egg, sliced avocado or guacamole, sliced scallions or radishes – maybe lightly pickled in some lime juice, Greek yogurt, creme fraiche, sour cream, shredded cheese, crumbled feta or Oaxaca cheese, cilantro, fresh basil, shredded carrot, salsa, Sriracha, salsa, roasted tomatillos, lime wedges, roasted corn, parsley, torn spinach, shredded Iceberg lettuce, diced tomatoes, corn chips, pickled jalapeños, chopped olives, and anything else you can think of. Heat up the olive oil in a large skillet and sauté the diced onion, garlic, and jalapeño until soft. Add a pinch of salt and the chili powder, cinnamon, cocoa or dark chocolate, and cumin. Stir for 2 minutes or until the spices become very fragrant. Remove from heat and reserve for future use. Combine the cut up vegetables, bean, tomatoes, tomato or Clamato juice, salt, and pepper to taste in a large slow cooker. Add the cooked onions and other aromatics and give everything a good stir to combine. Cook for 8 hours on low or 4 hours on high. Serve with the toppings of your choice and hearty buttered bread. This chili is even better the next day, when any excess liquid has had time to be absorbed and it keeps well in the fridge for 3-4 days. Freeze any remaining chili for up to 6 months. I’m so excited for Wild Nothing’s new album, Life of Pause, to come out in February; each of their songs always feel like a sharp and smart breath of fresh air. These new songs have so much energy, lots of shoegazey influences, and just the perfect touch of Bryan Ferry – all of the suitable components that make an ideal music for Ashley trifecta. If anything, that makes me feel like I’m in favourable company as a fan of a good beef stew, the kind that simmers for hours before you even think of eating it (or at least, you do think about it but restrain yourself.) This is a good beef stew to make if you don’t have any red wine on hand as most beef stew recipes call for anywhere between a half a cup and a whole bottle of the stuff, despite its absence this beef stew has an incredibly deep flavour with the perfectly brown beef accented by fresh rosemary and thyme, root vegetables, and a beautiful brown gravy that only gets better the longer it cooks. One of the best things about making a stew is the luxury of a mere half an hour or so of prep work and then the thing just sits on or in your stove, bubbling gently away, for anywhere between 2 and 4 hours while you carry on with your day (which for me meant reading cookbooks and absently tidying up the apartment.) 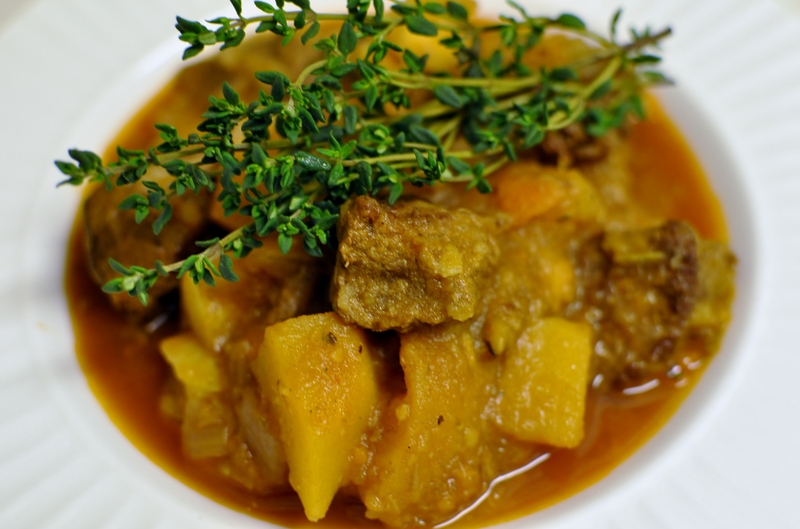 I just used the root vegetables that I like best, rutabaga and sweet potato would also make excellent additions and I have made a very successful version of this beef stew using red onions cut into large chunks at the stage where the root vegetables are added. This also tastes best the next day but I rarely am able to hold out that long – eaten the day of it is still entirely successful in terms of both its flavour and soothing properties. 1. The first step towards making beef stew is to brown the meat, many people use flour to speed up this process but I have always achieved what I think is a superior flavour when the flour has been omitted. Heat a large pot with the vegetable oil over medium-high heat for a few moments before adding the beef, you want the meat to sear almost instantaneously when it hits the oil. 2. Working quickly in batches (please resist the urge to crowd), brown meat on both sides – this should take no longer than 2 or 3 minutes. The goal is not to cook the beef but rather to create lovely caramelized bits of meat stuck to the bottom of the pot and to seal in the flavour of the cubed beef. Place the beef on a plate as you finish each batch. 3. Once all of the beef has been browned add a little of the beef stock to the bottom of the pot, scraping off anything left on the bottom of the pot from when the beef was being browned. 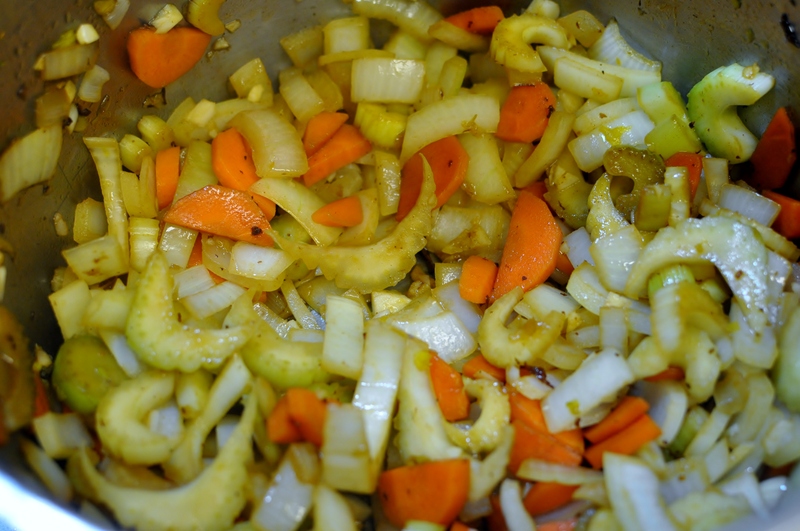 Allow to to boil for a moment and then add the onions, the entire head of garlic, the carrots, and the celery. Stir over medium heat for about 15 minutes or until they have softened and begun to brown. 3. Using kitchen twine tie the fresh thyme and rosemary together in a small bundle, tie the string to the pot handle so that the bundle has plenty of room to float around. Add the browned beef, bay leaves, salt and pepper, and beef stock to cover. Bring to a simmer, turn the heat to low, and cover tightly; let the stew simmer away for at least an hour and a half. 4. Uncover the stew and throw in the potatoes, turnip, and parsnip. Cover the stew again and let simmer at least another half an hour, uncover and stir in tomato paste and extra liquid if needed; let simmer gently for another 20 minutes. Taste for seasoning adjustments, remove the thyme and rosemary bundle, and the bay leaves. Serve immediately or for up to several days later, this beef stew also freezes very well for emergency comfort suppers and warming lunches.